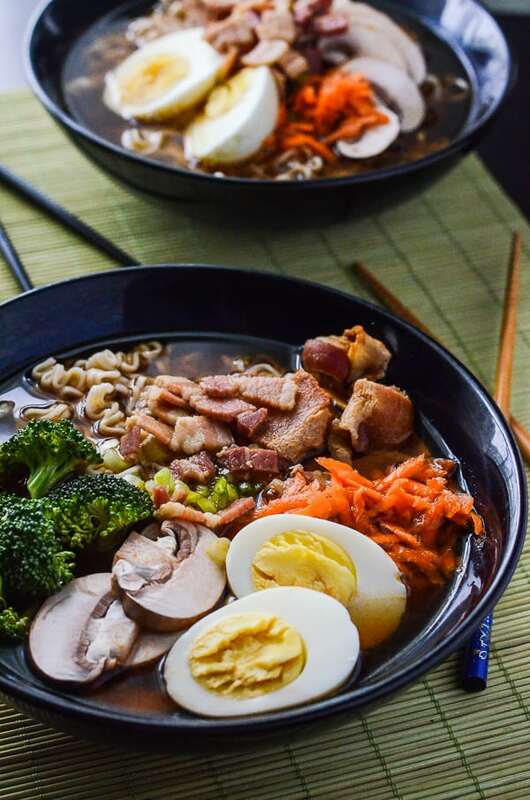 A quick and easy 30-minute miso ramen dish, created in tribute to Japanese culture, but enhanced with an essential American fat – bacon! 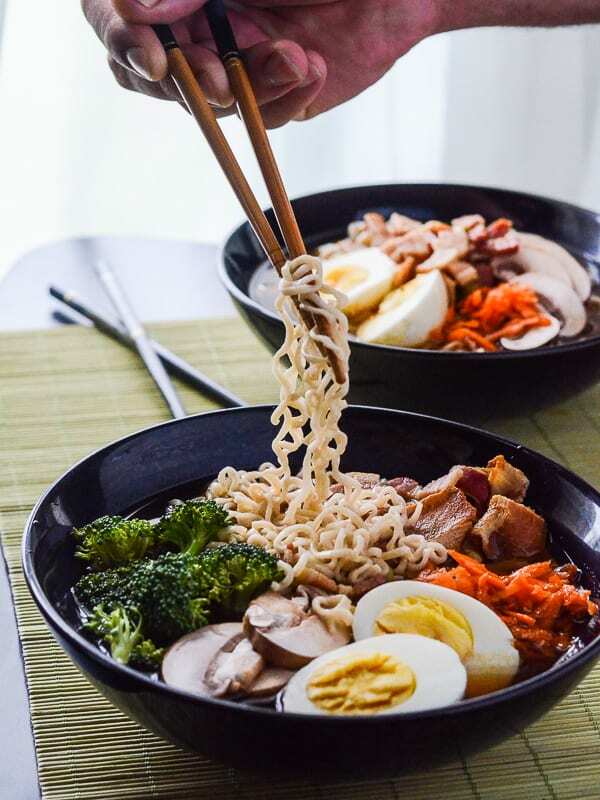 This hearty bowl of hot broth, filled with ramen noodles, crispy veggie garnishes, and soft boiled eggs is total comfort food. Konshū no #SundaySupper e kon’nichiwa yūjin, kangei! Hello friends, and welcome to this week’s #SundaySupper! This week, we’re taking you on a trip to the far East, and sharing our Asian-inspired dishes. From Chinese to Thai, Indian to Japanese, the world of Asian cuisine is exciting and varied, offering everything from the hottest spicy dishes to the coolest salads to the most interesting pasta plates I’ve ever seen. Mr. Crumby loves them all. He is enamored with Asian culture and food, and when I saw the theme for this week, I knew I would have to include him in my recipe creation. Little did I know he would take it over completely. Aside from researching the ingredients we needed, and going with him to the awesome little Asian market a couple of towns over, he…pretty much did everything. 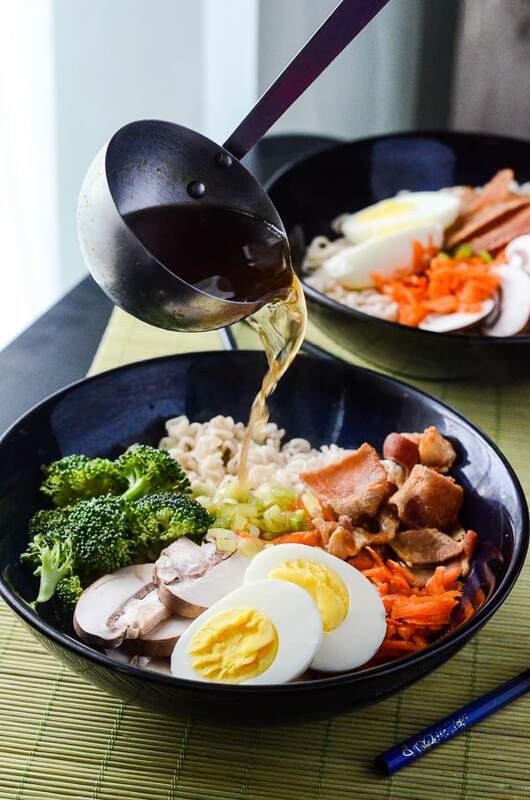 Feast your eyes on this Bacon Miso Ramen recipe, the second installment in the Mr. Crumby’s Kitchen series. The universe is getting back at me for complaining about the heat so much this summer. Yep. Our air conditioner is on the fritz. Imagine: I’m sitting in our media room as I type this. It has two big windows, one facing south, one facing west, and both have blinds and curtains drawn. The sun is on its way down for the afternoon, and it’s still 93 degrees outside. Not only is my computer heating the room, but Mr. Crumby’s decked out gaming computer (with two monitors) is also helping drive up the temperature. Our thermostat is set at 74, and yet, the A/C won’t cool the house below 84. We’ve had this problem on and off for a few weeks, now. It will act up for a few days, and then somehow right itself. We had a lot of rain last week, which kept the heat index lower than normal outside, so I guess it was working just fine. This week, though…holy cow, every day it gets worse and worse. The Mister was supposed to call the A/C company yesterday (Friday – a regular business day), but didn’t, because he wanted to try to DIY it. Which brings us to today, where we are sitting in front of a box fan, waiting on the repairman. Ugh. It’s a good thing we made this ramen last week when the temperature indoors was much more acceptable for soup. I totally can’t wait to make it again, either. Mr. Crumby grew up a gamer and anime nerd, and it goes without saying that he’s seen his fair share of ramen in the animated shows he loves. As far as eating ramen goes, aside from the 29 cent packets from the grocery store that every college student and bachelor is all too familiar with, the only time he had any was on our trip to New York City a few years ago. We found a Japanese buffet in Little Korea (because Little Japan was nowhere to be found), and they had an amazing spread that included build your own ramen bowls. I’m looking forward to finding the restaurant when we go back to NYC after Thanksgiving – I never committed the name to memory, only that we wandered past the Empire State Building and ended up there. It was a hidden treasure, and I really hope it’s still there! ○ Don’t be afraid to go light on the miso. It’s incredibly salty and depending on whether or not you use low sodium soy sauce, and how salty your stock is, you can very quickly overdo it. You can always add more, otherwise, you risk the need to water down your broth. And don’t season it with pure salt, whatever you do – you won’t need it. ○ It’s all about the broth! Take your time getting it perfect – the toppings you use are totally optional, but the broth is where your flavor is. Making a broth from scratch with bones and meat ends is the best way to go. 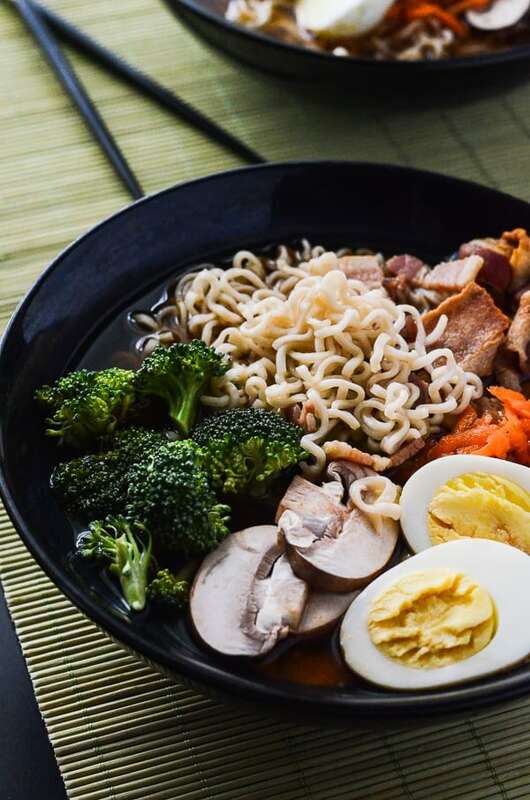 ○ If you can get fresh ramen noodles (or make them from scratch), do it! Fresh noodles are so delicious compared to the dried ones. BUT in a pinch, the 29 cent packs, minus the seasoning, work just as well. 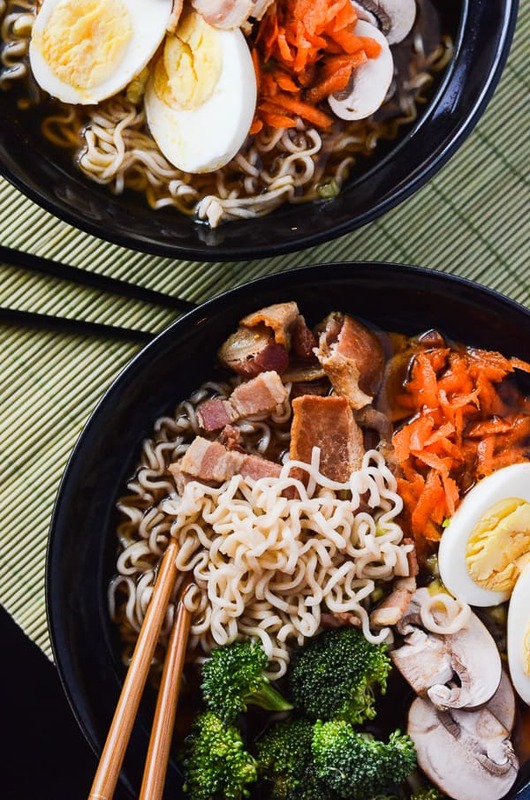 ○ Invest in the miso and dashi that you need for these ramen dishes. I promise you’ll use them for other Asian cuisines! ○ Ramen is surprisingly easy to make – not as intimidating as I first thought. It’s definitely worth experimenting with! ○ Eating ramen with chopsticks is hard. Those noodles are slippery little rascals. Plus, bacon. I mean, come on. How is it not in every ramen dish? 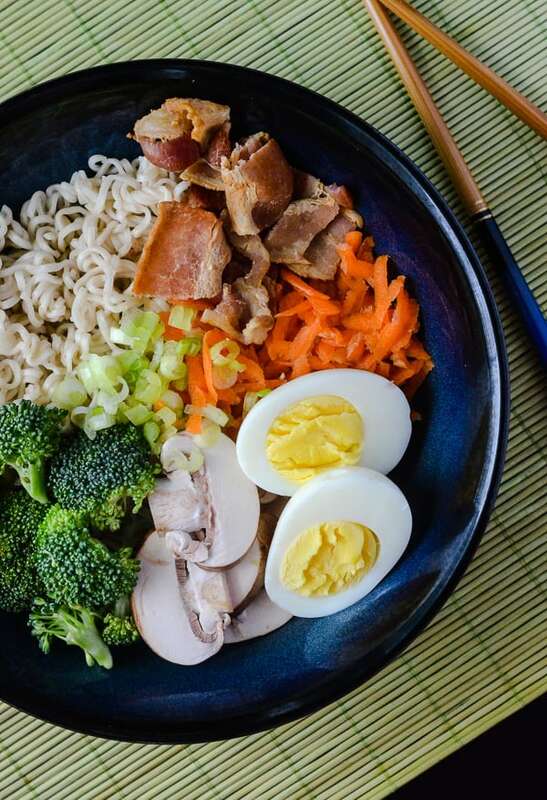 A quick and easy 30-minute miso ramen dish, created in tribute to Japanese culture, but enhanced with an essential American fat - bacon! 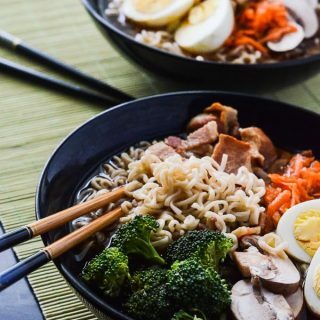 This hearty bowl of hot broth, filled with ramen noodles, crispy veggie garnishes, and soft boiled eggs is total comfort food. In a wok or large saucepan, fry bacon on medium-high heat to render grease. After some of the fat is released, add 1 diced scallion, and saute for about 5 minutes. Remove the bacon and set aside. Add annato seeds to fat and simmer for about 2 minutes, to release some color, then remove the seeds. Combine beef stock, dashi, and soy sauce in wok, and return the bacon to the liquid. Bring to a boil for a few minutes, stirring once or twice, allowing the flavors to blend. Stir in the miso paste ½ teaspoon at a time, until the broth reaches the desired flavor. Reduce heat and simmer while you set up your bowls. In a separate saucepan, bring 3 cups of water to a boil. Boil the ramen noodles, 1 serving at a time, for about 3 minutes each - you want them to be semi-al dente. Arrange your noodles, egg halves, and vegetables in large soup bowls, then ladle hot broth on top of everything. Drizzle with chili oil for a little kick of heat. Enjoy! Inspired to have Asian night for dinner this week? Check out what my fellow #SundaySupper folks made for you to drool over! sounds like you picked up some good ramen making lessons…not to mention lessons about the limits of DIY! I hope your house is well cooled by now! I’ve only had those cheapo ramen noodles and can imagine how much better fresh would taste. Your noodle bowls look marvelous! What a beautiful dish! This looks delicious! Omg I don’t know if I love this soup more or the story behind it. Our Mister’s are too much alike! He has to try everything himself! Oh and yes to the bacon! What a great recipe – my husband would absolutely love this, too. I have never craved ramen more than after seeing your photos. I think my stomach growled as I was reading along. I find that most Asian food is simple to make. Most important is having all your ingredients prepped and ready to go because it goes fast once you start cooking. My husband would LOVE this! Looks like we’ll be making miso ramen soon! As usual, beautiful pictures! I love this. My boys would gobble this up. Great idea for a noodle soup. The bacon sounds delicious! I love it in other soups so why not ramen? 1st This looks YUM! 2nd our AC had similar issues…check/change your filters 1st. It may fix the problem. I love Asian inspired food so I really want to try this! Thanks for sharing! My husband would kill for me to make this. Looks great! 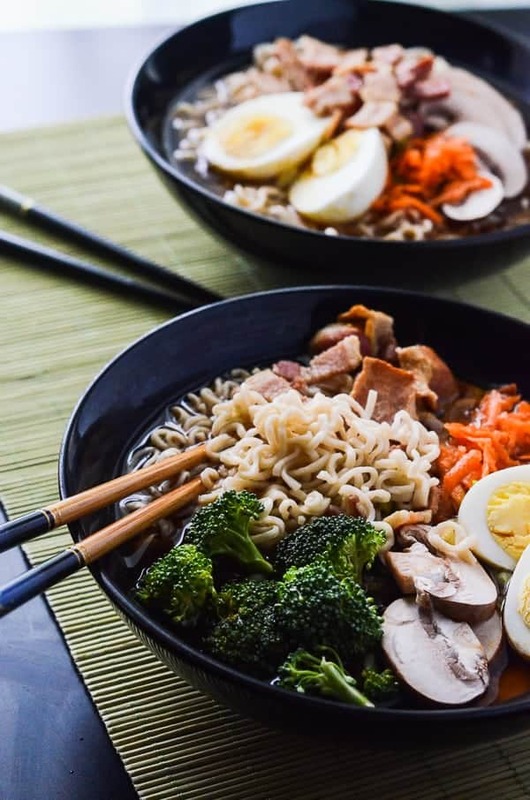 I have never made ramen at home and I’m dying to try your recipe. Bacon makes everything awesome! I’ve wanted to make ramen at home forever and this is pushing me over the edge. It looks beyond delicious! I definitely have to add this into our dinner rotation. It looks delicious! Mmm, this looks so good and I didn’t realize how easy it was to make.